Back in 2011 I covered my international cellular usage for a trip to Italy. In 2015 we traveled to Ireland so I looked again. As you would hope AT&T has simplified and lowered the prices on their international cellular plans. As of May 2015 here are their plans. Unlike 2011 you can't pro-rate these plans when you get back. But there is still an angle. Keep on reading. The cost per megabyte has dropped. In 2011, 125MB was $50. In 2015 120MB was $30. In 2011, texts were $.20 each. In 2015, texts sent are free. Texts received are charged at your domestic rate (free for me on Mobile Share Value Plan). Voice is the same as 2011 at the Passport level. The unlimited texts were nice for us as we tended to text among the travel party. Several of us had iPhones which iMessage uses data so we had to log them out of iMessage. On an iPhone, a day before leaving you should turn off iMessage. To confirm this send a couple of text messages. The bubbles should be green instead of blue. When the bubbles are green, even international texts are free with AT&T's Mobile Share Value Plan. The only downside is that text messages won't go to an iPad. When you land overseas, you need to make the following changes. First turn off "Background App Refresh". All the apps will still work but you'll just have to initiate their updates, e.g. e-mail. Then turn on "Data Roaming". At the bottom of this screen is a menu item to "Reset Statistics". If you tap this it'll reset your data usage tracking so you can see where you are against the AT&T international plan. Then undo all this when you get back in the U.S.
Android is not so complicated. 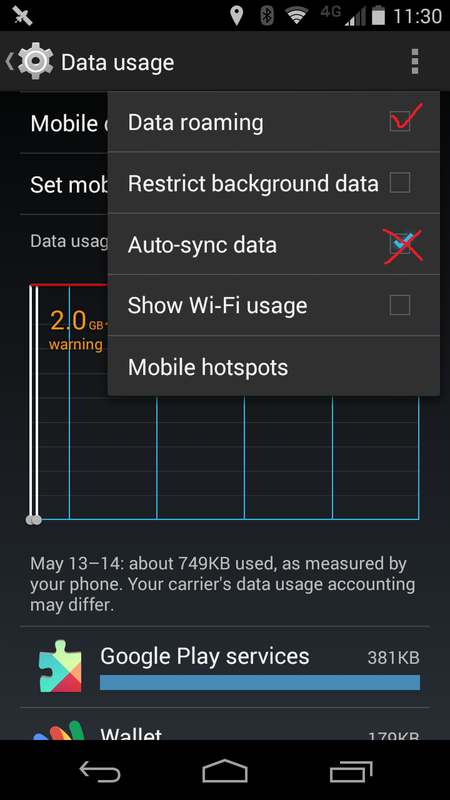 Just turn on "Data roaming" and turn off "Auto-sync data". On my Moto X, the LTE bands on AT&T's Irish partner weren't supported so I expected to only get UMTS+. However in the areas where I was (really rural) I mostly got 3G and sometimes even EDGE. When I returned I called AT&T and they could tell me the data usage and calling minutes. They then re-rated the plans to the most cost effective. This saved me $33. But let's think for a second about the two different types of "messages." First there's the traditional text only, single recipient message. That is called Short Message Service (SMS). Second there's the message with a picture or multiple recipients. This is called Multimedia Messaging Service (MMS). SMS messages don't require cellular data. 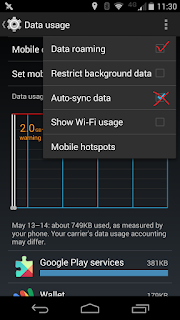 MMS messages do require cellular data. And this cellular data will count against your allowance in the Passport offering.